Apple today has released iTunes 9.2 for both Windows and Mac. This release brings support for iPhone 4, iOS 4 (formerly iPhone OS 4) for iPhone and iPod touch, support for organizing iOS 4 folders, faster backups with iOS 4, PDF syncing with iBooks and various other bug fixes. Full change log of iTunes 9.2 is as follows. Note for Jailbreakers: Those of you who want to jailbreak your iPhone, iPod touch or iPad in “future” using current version of Spirit jailbreak tool should stay away from this release. 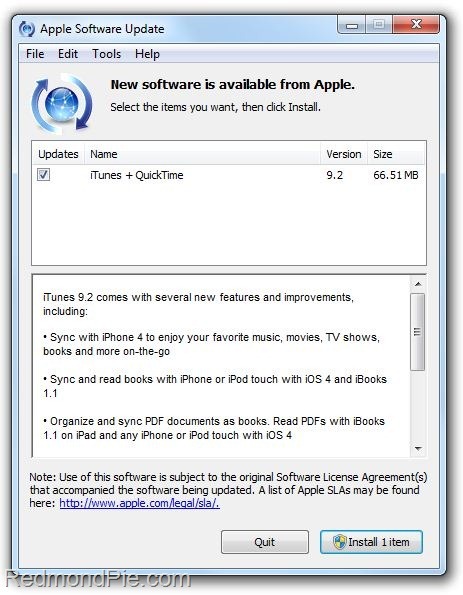 But those of you who are already jailbroken using Spirit, redsn0w, sn0wbreeze, blackra1n and PwnageTool can safely update to iTunes 9.2.
iTunes 9.2 can be downloaded for both Windows and Mac OS X from Apple Software Update, or directly from the link given below. So my Iphone 3gs os 3.1.3 jailbroken through spirit its ok to download this update? wait so u mean like if u already have ur ipod jailbroken with spirit can we update itunes? is this going to affect the iphone 3GS 3.1.3 with the 05.12.01 baseband that i've been waiting for the new jailbreak and unlock release??? i have an iphone 3GS 3.1.3 with a 05.12.01 baseband awaiting for the jailbreak and the unlock release, updating the new version of itune,will i be able to still jailbreak and unlock my phone when the release is out ?? ?with the new itune..
WHAT about 3g? Can i upadte my jailbroken 3g? I am also waiting for the release of the unlock tool for the 3GS 3.1.3 05.12.01 , but I already jailbreak my phone with Spirit. I would like to know when will be out the unlock tool for 05.12.01 baseband. I just think I must wait before update itunes, I am correct ? does this mean we can now jailbreak iphone 3gs with iOS4 using windows? Can i jailbreak my ipod touch 1g 4.0 with this? and if i do will my cydia/winterboard stuff will get erased? I have a 3GS running 3.01 jailbroken…..can I still use this to upgrade to 4.0? have and ipad version 3.2, but i use iTune 9.2(61) can I JB like this or do I need to have an earlier iTunes version? greivinb@gmail.com I can help you, this 2G iPod touch is MB or MC model? I tried to jailbreak my iPhone 3Gs 3.1.3 with blackra1n on iTunes 9.2, but my phone got stuck in the connect to itunes and I got an error message on iTunes saying that I have to restore the iphone and upgrade to software version 4….can anyone help?? how do u download it’s confusing man u download tht thng frst step den hw u du d second one? If you haven’t tried already you try to reset your iphone. how you do that is you hold both of your buttons at the same time, the top one and the bottom one. If it doesn’t work than I don’t know anything else to do other than restoring it on you Itunes.